Styled with wedgie straight and benji camisole . The Jagger is a classic moto with a clean funnel neck and slim, flattering fit. It’s cut from supple leather that’s been specially washed and waxed for a lived-in look and luxurious feel. It has a breathable cotton-blend lining and shiny hardware. It fits perfectly. I am 5’8 1/2” with a long torso and lean build. I ordered a small. I have room for a thin sweater underneath. The leather is soft and delicious! It will age beautifully. Cannot wear comfortably with a sweater and a long sleeve t shirt under. And the snaps are different than I'm used to. But other wise good. Edgy, but classic wardrobe staple. Couldn’t be happier with this jacket! 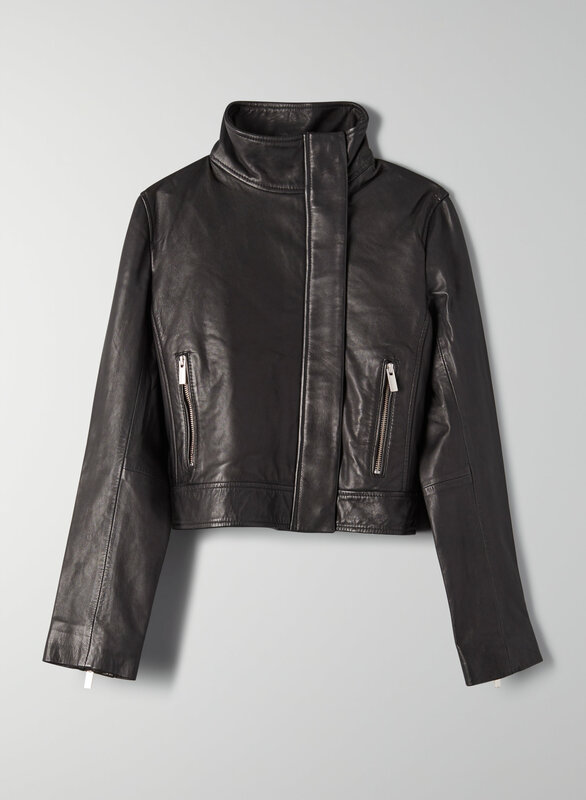 The leather is of superior quality, and the style of the jacket is perfect. The collar can be worn up or down, depending on the look you are going for. Also, the hardware is not overwhelming, just a touch of metal. I looove this jacket!